My phone would not be the first place I’d think to go when I want to play a great racing game, but last summer Asphalt 7 changed my perspective . Now there is a new contender on the starting grid in EA’s Real Racing 3. The question is: does it get off the line clean, or spin its wheels at the drop of the flag? (-) A.I. is problematic at times. Rubbing is racing… And it will cost you. Definitely paid dearly in this race. 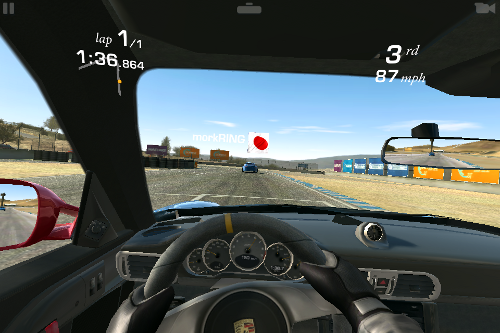 Real Racing 3 is the latest entry in the Real Racing series of mobile games developed by FireMonkey. The first thing that caught my eye with this game is that it is a very simulation styled racer, something I’d had no experience with on a mobile device (but more on the simulation aspects later). There over 45 different cars fully licensed from most major manufacturers (including Porsche), the track are real race courses from around the world. As you might guess by looking at beautiful screenshots of the game, it is big. I found it to take up 1.1 gigabytes on iOS and 1.19 gigabytes on Android. That being said, it looks very good. The level of detail of both the interiors and exteriors of the cars is impressive, and the lighting effects are downright breathtaking at times. When comparing the Android and iOS versions the difference in the graphics is noticeable, with the iOS version having much more detail to the tracks. The paint on the cars also looks more realistic. 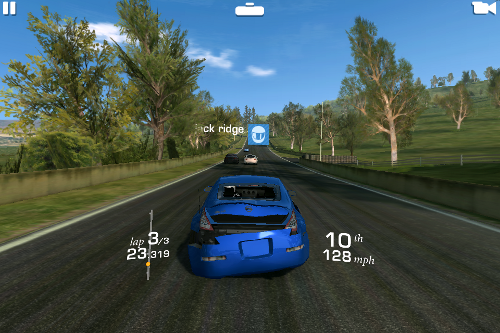 There is one other major advantage that the iOS version has over the Android version: the mirrors work on iOS, which is extremely helpful when trying to defend against advancing cars. 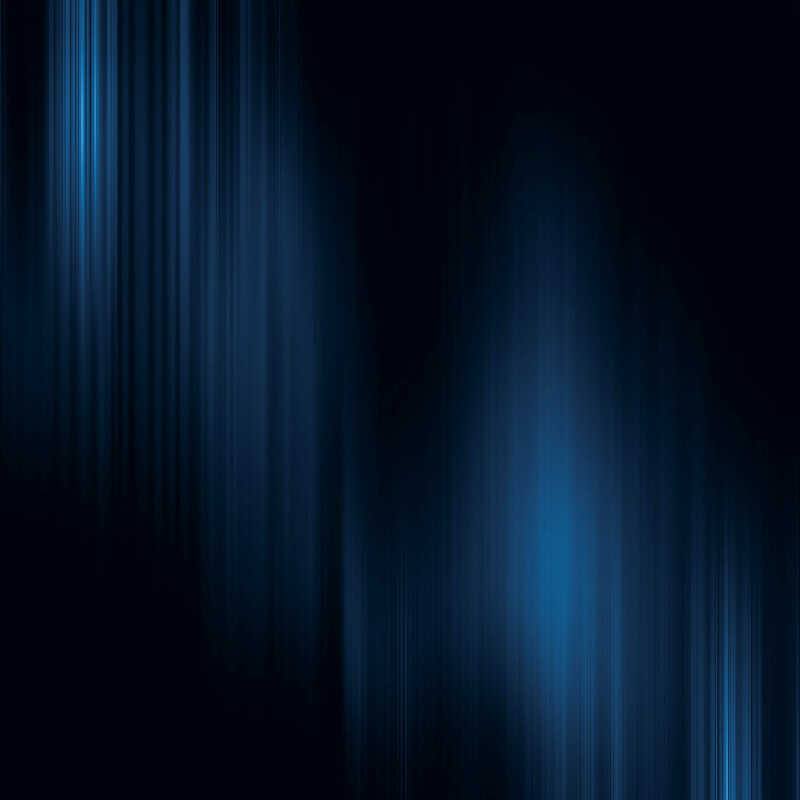 In the Android version on my Nexus 7, they are just grey, not showing anything. The semi-truck in the room of course is that this game is entirely free with microtransactions in it. I saw a number of people worrying when it first came out that after you reach a certain point you would almost be forced to pay to progress in the game. All I can say is that I’ve put just over 33 hours into it so far without spending a dime, and it looks like I will not need to anytime soon unless I want to. Back to the simulation aspect from earlier: in my experience, I have found controls are usually the limiting factor for racers on mobile devices. I have played some great mobile arcade racers but never a good simulation racing game. It was a pleasant surprise then to find out that RR3 knocks the controls out of the park. The tilt steering is extremely precise, exactly what you want for a simulation racer. Each car has its own distinct feel, with muscle cars steering like ore-boats and race cars darting around corners like water-bugs. Don’t be afraid if you are not great at sim-style racers. RR3 has several different assists that you can turn on to help out with steering and braking. Heading into the first chicane. If you follow any racing or watch Top Gear there is a chance you may recognize some of the tracks included in the game. 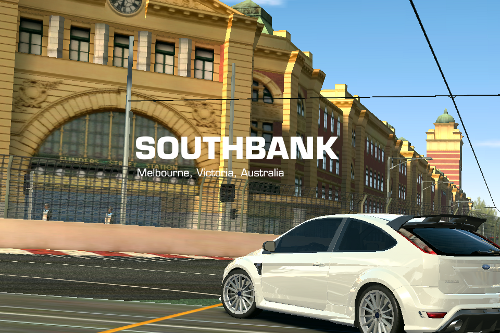 The tracks run the gamut of styles, from the tight city streets of Melbourne to the long sweeping straights and technical corners of Mount Panorama. Becoming familiar with the ins and outs of each one is key to being successful in races. Speaking of the races, there are a number of different types of races to compete in. The events include standard races, one-on-one battles, model specific races, speed challenges, drag races, hunter races, and endurance challenges. RR3 features EA’s new “Time Shifted Multiplayer”, where each car you race against is a real person. It does this by taking players race times and having the game’s A.I. drive each car so that it completes the race in those specific times. No two races are the same, as how exactly that time is achieved will vary. The races are usually quite challenging, but the A.I. is troublesome at times. Other cars will sometimes seem oblivious to you and drive as if you weren’t next to them. The A.I. has improved with updates but still is problematic at times. 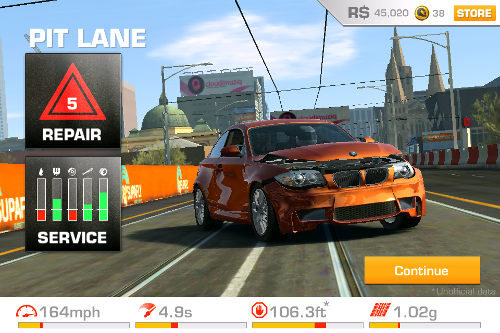 Racing is rough, and being a simulation racing game means this will take a toll on your car. Maintaining your fleet is a big part of the game. Any damage your car takes will affect your vehicle’s performance. Break your windshield? That will decrease your top speed by a few mph. Rip that bumper off? You’ll feel your car have less grip through the corners. Repairing the damage is comparable to the cost of the parts for the real car. This means that while you can usually afford to beat the crap out of your Ford Focus RS to win a race, if you do the same thing with your Porsche RSR Concept, you’ll find that you’ll be spending way more money on repairs than what you earned by winning the race. In addition to the repairs, your car’s engine, oil, brakes, tires, and suspension will all need service over time. Driving hard will make the time between services shorter, and unless you want to pay in-game gold, it will take anywhere from a few minutes to a half-hour to service your car. Each car also has its own upgrade tree which will increase specific aspects of its performance. For example, fitting better tires will allow the car to handle more g’s through the corners, a better drivetrain will shorten its 0-60 time, etc. The more expensive the car, the more upgrades will be available. 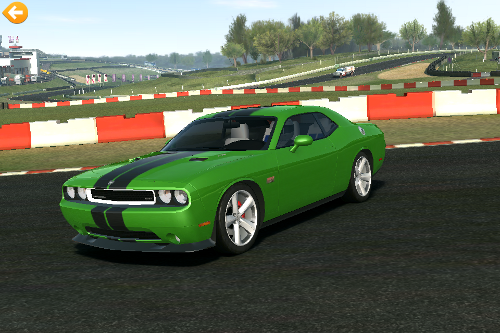 This entry was posted in Android, iOS, Reviews and tagged Android, ea, ios, Mobile, racing, Real Racing 3, RR3. Bookmark the permalink.